Both engines recently rebuilt according to MTU guidelines. Air Conditioning - Condaria 90,000 BTU reverse cycle, Digital control units + Extra heating boiler. MTU Electronic Engine control panel, Hamilton Jet control panel, Anchoring control panel, Bowthruster control panel, 2x Search lights Sanshin HR-1012 control panel, 2x Robertson FU-91 autopilot electronic rudder control, Wipers control panel, Corrosion monitoring control panel. Accommodation for 8 guests and 4 crew. Master cabin with double berth, en-suite heads with jacuzzi. VIP cabin with double berth, en-suite heads. 2x further guest cabins, each with twin single berths with Plasma TV's in all cabins. 2x futher cabins for crew, each with twin single berths, accessed via engine room or from midships on the starboard side. The main deck area comprises a large saloon, with separate dining area, bar and kitchen. Condaria 90,000 BTU reverse cycle air conditioning with digital control units. 2x hot water boilers. Hidromar watermaker (180l/h). Cockpit/aft deck with large table and sofa. Flybridge: 3 tables + 3 sofa/solarium, Jacuzzi, full wetbar with barbecue, fridge, and icemaker. 35 HP bowthruster, electric side boarding ladder, Bitecnomare hydraulic passerelle, 2x Aft winches, 400 KG crane on flybridge for launching tender and jetski, folding bimini on flybridge, auxiliary and watercraft area on flybridge. Furuno SSB Transceiver FS-1150IT Radio, ICOM VHF Marine IC-M601 Radio, Shipmate RS 8300 Radio, Raymarine E120 GPS/Plotter, Robertson AP9 Mk3 Autopilot, Raytheon V850 Colour Echo Sounder, Furuno Radar, Raytheon Ray 430 Loudhailer, Panasonic internal phone system, Engine room and aft Internal CCTV system, STN Atlas SP 1600 comms Satellite system, Raymarine ST60 Depth, Raymarine ST60 Speed, Raymarine ST60 Tridata, Raymarine ST60 Graphic, Raymarine ST60 Anemometer, Dataline rudder indicator, 2x Compass at wheelhouse, Hydraulic control panel on flybridge, Navigation controls and instruments repeated on flybridge. 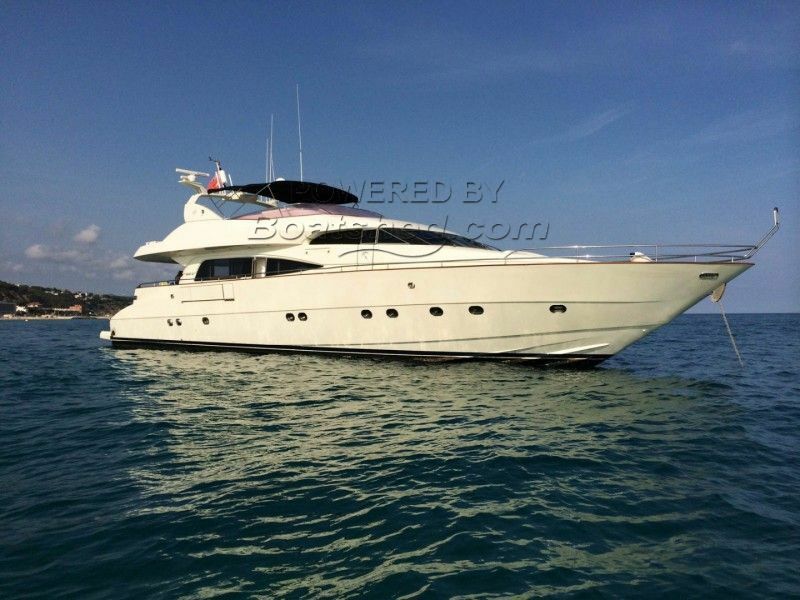 This magnificent luxury motor yacht is offered for sale as a successful charter business and is fully MCA coded. Including existing bookings, management and crew. Fully refitted in 2012. She can accommodate 8 guests in 4 cabins (double master cabin including jacuzzi, double VIP cabin and 2 further guest cabins with twin single berths, all en-suite). There are also 2 crew cabins which can accommodate 4 crew. The main deck has an elegant large saloon with a light and comfortable interior, with an adjoining dining area for up to 8 guests and a bar with open-plan galley fully equipped. The unusually spacious flybridge offers a seating area, perfect for al- fresco dining, protected by a sliding bimini, a jacuzzi and sunbathing space. There is also a generously proportioned aft deck with large table and sofa, with steps down to an equally generous bathing platform. This yacht is powered by 2x MTU 1850 hp engines with twin Hamilton jets which mean noise and vibration are kept to a minimum, even at high speed and also provides a very low draft of just 1.24m. A Zodiac tender and Seadoo jetski are also included which are lifted in and out from the crane on the flybridge. A full PDF specification and charter business details are available on request. Please also contact us if you would like to charter the yacht or book for accommodation only. This Mochi Craft Mega 25 has been personally photographed and viewed by Paul & Steve of Boatshed Barcelona. Click here for contact details.